Video of The Economic Club of Washington, D.C.’s 25th Anniversary Event held on June 5, 2012, featuring Economic Club President David Rubenstein. 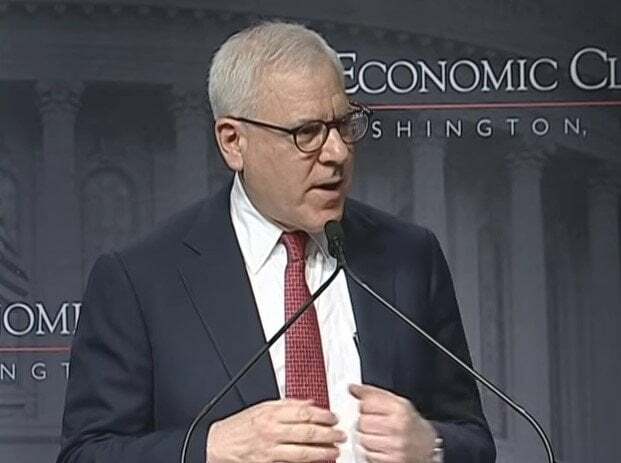 I'm David Rubenstein the president Economic Club of Washington and on behalf of the Economic Club I want to thank all the members and their guests for coming this evening to our 25th anniversary celebration and I particularly want to thank our special guests Warren Buffett for coming. Thank you very much. I want to thank our major sponsors this evening. We have a number of them and let me thank them right now. Orchard Global Asset Management Paul Horvath. Paul thank you. They're one of our legacy sponsors the other legacy sponsors PricewaterhouseCoopers. Chris Simmons Chris thank you our heritage sponsors Accenture Stu Solomon. Thank you. Lee technologies. JOHN LEE Thank you. Mercator 21 Chris Cain Chris OK MicroStrategy Michael Saylor Michael Ware Volkswagen group American David Genn accomplice. Thank you. And I want to thank you can see in your program our distinguished and tribute sponsors are listed in our program and I want to thank all of them and want to thank everybody here for coming this evening. And I want to especially acknowledge this evening two of my predecessors Senator George Mitchell who has served as president of the Economic Club awash in George Mitchell Senator Mitchell right there and my immediate predecessor Vernon Jordan. VERNON There were two other presidents Economic Club of Losh and the first one was Bob Linos and the late Harry McPhearson so they both did an incredible job of getting the economic club of Washington off the ground. I'd like to also recognize some of our special guests this evening the Ambassador of France is here somewhere. No. And the ambassador from Brunei is here. Thank him. The governor of Maryland Martin O'Malley is here. MARTIN O'MALLEY Thank you honorable Julius Genachowski chairman of the FCC Julius is here. There he is. Thank you. Victor Hoskins deputy mayor for planning of the District Columbia. Victor there Kaya Henderson Chancellor District of Columbia school system is here somewhere and Nat Gandhi the chief financial officer district this year. Thank you. And Wayne Cluff the secretary of the Smithsonian Wayne. Thank you we have another person who wanted to be here this evening who could not be here. And he sent a special message show we have that special message. Now congratulations to the Economic Club of Washington on your 25th anniversary. I particularly want to recognize your president David Rubenstein and all the other leaders who have built this organization over the years. For a quarter of a century you've helped strengthen the local economy and you've hosted leaders from the worlds of business policy and philanthropy of course in tonight's keynote speaker my friend Warren Buffett. You have all three at once. I was also delighted to see that you're following Warren's example by donating the proceeds of your gala to help disadvantaged young people. I wish you many more years of success as you make Washington a better place to work to do business and to live. Thanks and have a great evening.